It doesn’t matter if you have a significant other or not: Valentine’s Day cards are a must. You may need a card for your parents, a sibling, a best friend, or even your boss or coworker. Now that we aren’t in elementary school anymore, there’s (usually) no need to buy a box of Valentines anymore, but maybe you don’t want to spend money on 4 or 5 individual cards. Instead of buying them, why don’t you make them? You can create a gorgeous card from scratch, and you may already have some if not all of the supplies you need. First, use your scratch paper to create a template like she does. You can create whatever design you’d like, but she creates a heart. Use this template to make the heart on your card with pencil. Use masking tape to tape your watercolor paper down to your cardboard and begin watercoloring on the outside of your heart design. She uses reds, purples, and pinks for a Valentine’s vibe. 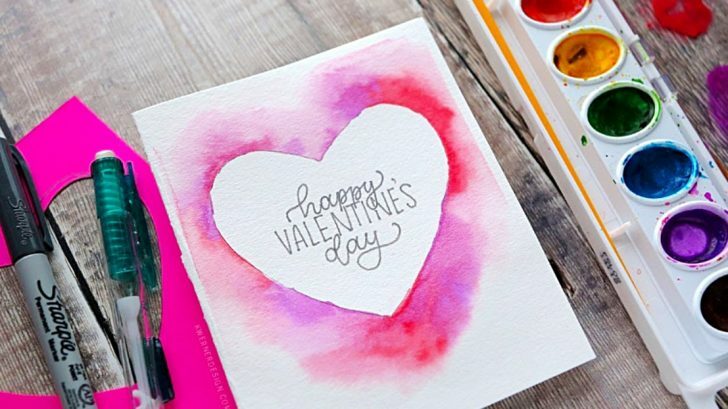 Once that dries, use your pencil to write out a phrase in the middle of the design, like “Happy Valentine’s Day.” Go over it with your permanent marker. Write on the inside of the card whatever you’d like and you’re done! Whoever you end up giving them to, have a Happy Valentine’s Day and have fun DIYing!